Modern Solar thermal energy can be a economical way of generating clean electrical energy on a large scale. 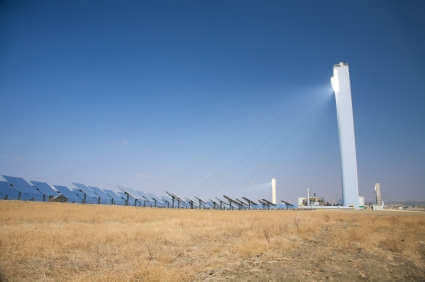 Solar thermal energy is the use of solar heat energy striking mirrors which focus the heat on to pipes carrying water. Steam is created which can be used directly or feed into turbines to generate electricity. The largest system to date is 9 solar thermal plants in California's Mojave Desert that generate at total of 354 MW of electricity. With the world concerned about climate change and sustainable energy, solar thermal energy is once again becoming popular. 50 MW solar thermal plants with thermal storage using molten salt have been set up in Spain under the name Andasol 1 2 3. Thermal storage allows for electricity generation at night or when overcast. Ausra has completed a 25 MW steam to 5 MW electricity plant in 2008 for $15 M US. An Ausra proposed 177 MW solar thermal plant would cost $500 M US and cover 1 square mile. 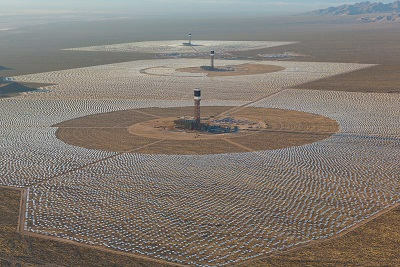 Other solar thermal plants are expected in the USA, Spain and Australia. No cost energy input for electricity generation unlike coal and gas. Can be used with existing coal and gas thermal generation plants to preheat water and save the use of fossil fuels. The running costs of Solar Thermal are cheaper than coal or gas. Solar thermal can be used to create steam for hospitals or industrial processes. Mirrors can be built above other land use such as car parks or roofs. This also provides shade and cooling for what is below. Steam can be stored to extend the useful operating hours of solar thermal. This can also help with electrical load balancing. Arid non farming land can be used to create electric energy. Solar thermal energy production and daily energy demand track in a similar fashion with temperature. Solar thermal is much cheaper than diesel generation in the outback. Solar thermal requires conventional materials and known skills such as metal fabrication and boilermakers. 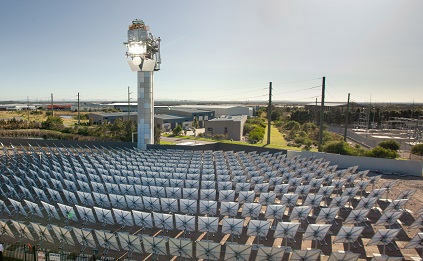 Modern solar thermal uses less land than other types of solar power. Green power can be sold at premium prices. Avoids any carbon pollution based taxes or fees. No transport costs for energy input. Avoids variability of energy input prices. Molten salt tanks at approximatley 380 degrees Celsius can store solar thermal heat energy for night time electricity generation. The areas needed for Solar Thermal can be large. The ideal locations for solar thermal may be a distance from the intended load. Solar thermal may need to be supplemented by gas thermal energy at night or during extended overcast weather. The initial capital costs for solar thermal is large. Mirrors may require periodic cleaning. Build time could the longer than other forms of energy generation. Concentrated Photo Voltaic power. This uses mirrors or lenses to focus sunlight e.g. 1000:1 on to high efficiency solar cells. The structure tracks the sun for maximum efficiency. Fixed or tracking Solar panels. This is easier to set up and components are available from multiple suppliers. Micro wind energy. These can come as kits and can be set up as a group with little engineering knowledge. Large wind energy. These can scale up to 6,000,000 watts each. There is a lot of work required in creating the tower structures. Wave energy. This can come in different forms. One form uses wave swell to pump water on shore to be used for turbines directly and/or reverse osmosis water purification. Total land available in metres squared. 4046 m2 = 1 acre, 10000 m2 = hectare. 1 M m2 = 1 sq km, 2.59 M m2 = 1 sq mile. Press this button after adjusting values in the top table. Where could solar power be used near your location? Solar Millennium Manuacturer The style used is continuous mirrored metal troughs with a pipe at the focus point. This company built the Spain Andasol solar thermal plants. Ausra is a Solar Thermal Manufacturer The style used is multiple continuous mirrored metal troughs with a pipe at the focus point. E.g. 3 pipes 1000 feet long, each pipe has multiple mirrors focusing on the pipe 100 feet wide. This create 5 MW electricity. Bright Source Energy is a Solar Thermal Manufacturer The style is tracking mirrors pointing to a central tower. Stirling Energy is a Solar Thermal Manufacturer The style is a tracking mirrored dish with a Stirling thermal energy engine at the focus point. How wind energy can reduce diesel generator demand Real time monitoring of wind energy. Energy Efficiency Calculators | Solar Energy Section | Zero Electricity Bills - How many solar panels do I need?